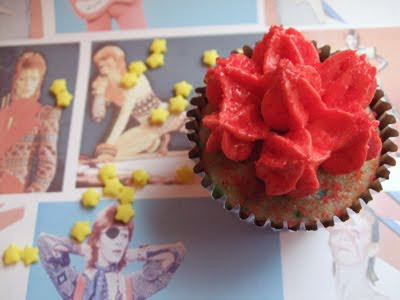 The most glamorous cupcake in the world: Ziggy Cupcake and the Sprinkles from Mars. My sweet contest cupcake has a smutty side, a glamorous, androgynous, hedonistic streak. 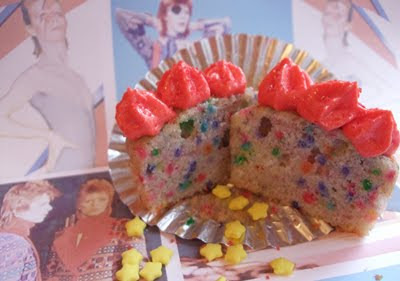 Meet my entry: Ziggy Cupcake and the Sprinkles from Mars. David Bowie’s legendary album inspired this baking adventure. It’s one of my favorite records, and I thought it would be a playful muse for my original cupcake. I paused. And then I stood up. “There’s no doubt that Bowie is top shelf all the way.” I bought the Cointreau. Shiny foil wrappers are reminiscent of Bowie’s Ziggy costume. A similar thing happened as I was making the frosting. Getting frosting a deep color is time consuming. Just when you think you’ve added enough food coloring gel, you beat the frosting to find that there’s almost no change. Gah. Add some more, beat some more. Add some more, beat some more. I don’t think this is working, I said. But then I asked, “What would Bowie do?” And the answer was keep going until it was over the top, and then push it some more. And I kept going, and the cupcakes were more eye-catching for it. I present cupcakes that don’t back off, cupcakes that tease your sweet tooth. Ziggy would approve. Please vote for Ziggy Cupcake in the IronCupcake:Earth Music Challenge. Click here to cast your vote! The link will take you to the blog No One Puts Cupcake in a Corner. There is a box with a scrollbar on the right side of the page for voting that says “Choose 3 – IC:E Music.” Vote for me by checking “Sie Macht.” Pictures of Ziggy Cupcake are pretty deep in the blog post. 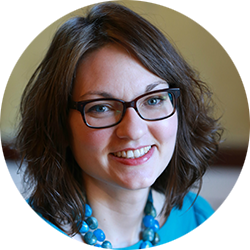 Voting ends at noon Thursday, Nov. 5. Many, many thanks. You rock. Cream butter and sugar until light and fluffy. Beat in yolk and vanilla until fluffy. Beat in bananas. The mix may come apart here, but don’t panic. 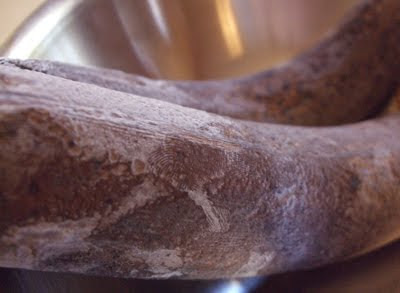 Frozen bananas thaw in a bowl. Sift together flour, baking soda, and salt. Add flour in increments to wet batter. Scrape bowl frequently. In another bowl, beat egg whites to soft peaks. 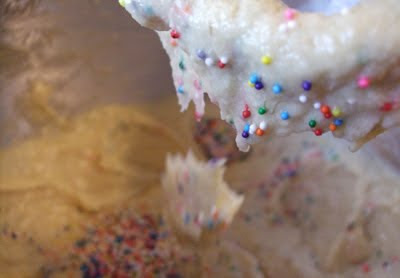 Cake batter falls into the mixing bowl. Be tender mixing the nonpareils into the batter. 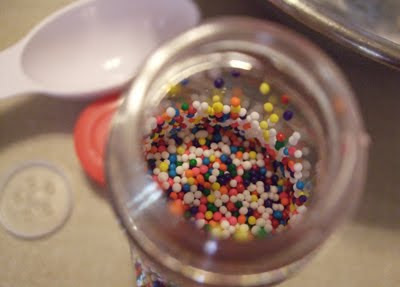 Gently mix nonpareils into batter. Fold egg white into batter. It’s OK to have white eggy streaks. 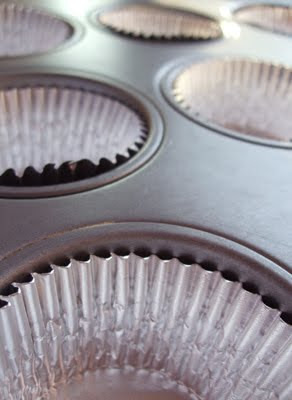 Frost cupcakes after they’ve cooled. Glamfetti is revealed in a cross section of the cupcake. This makes A LOT of frosting, probably enough for two dozen cupcakes. Beat together butter, shortening, and salt until fluffy. Add about half the powdered sugar and beat lightly until well blended. Add almond extract and about half the Cointreau. Beat until fluffy. Add the sugar and Cointreau alternately, scraping the sides of the bowl after each addition. 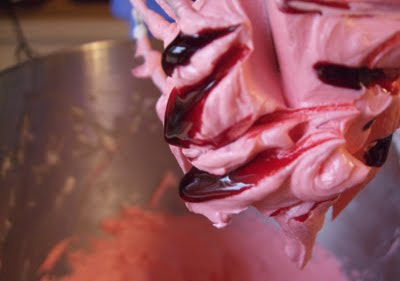 Streaks of food coloring gel are added to the frosting. Getting a deep frosting color takes patience. Add red coloring by dipping a clean toothpick into the jar and wiping the gel on the top of the frosting. Use a clean toothpick each time you dip into the color to prevent contaminating the jar. Beat the frosting. Keep adding coloring to achieve the desired dark orange red. 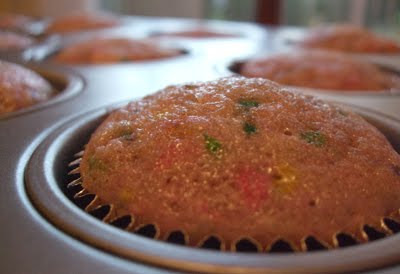 Add yellow coloring drops and beat the frosting. This is a tedious process. When you think the frosting is almost dark enough, put it in the fridge for an hour. The frosting will get darker. Apply the frosting in any fancy-pants way you please. I used a 1M star frosting tip. Finish the cupcakes with red sprinkles from Mars. The nonpareils, I mean glamfetti, make the cupcakes a little pink. This is my favorite post so far. Well written, tight and fun. My new mantra is "What would Bowie do?" This is pretty wonderful all around – from the recipe to the conception behind it. I also love that your cupcake is both glamorous and androgynous. You had me at that already. This looks great, I wish a free cupcake came with voting 😉 But even so, I went and cast my vote for Ziggy in the contest! Good luck! !